When I work from home 'Procrastination Station' is my destination. I find every possible excuse to put everything off until later. This might be 'researching' if any of my household objects are worth a small fortune by watching a lunch time antiques programme, deciding that the whole house 'needs' to be vacuumed or just putting everything off until later because 'I work better in the evening'. 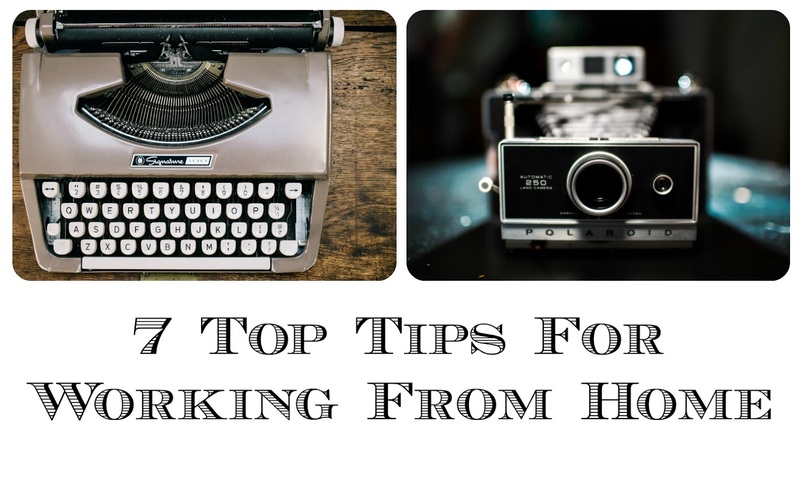 Anyway - I know some great people who achieve fabulous things when they work from home so asked for their Top Tips and here they are. This was a really popular tip and almost everyone mentioned it. Whether it's the corner of your living room, a whole different room (here's a nosy round my own home office) or the garden shed, make sure you have a completely separate area for your work tools. It has to be somewhere that you can physically leave your work so that there is that work/home allocation. It probably feels more comfortable to slob around in your onesie, especially if the only person you're going to see is the postman when you sign for a treat for yourself from Amazon work-related parcel. You don't have to be suited and booted but physically making yourself get up, brush your teeth and your hair and dressing for the occasion will give you a great sense of purpose. Have proper working hours. They don't need to be 9-5, after all, you're possibly working from home to avoid those rigid hours - but do have a set time to work. Make sure you have screen-breaks and scheduled brew/lunch breaks. Even make yourself a meal and put it in a bag on your desk or on a plate in the fridge to ensure you take time out to eat. Finish at your allotted time and don't feel tempted to 'just work an extra hour' because you don't have to drive through the rush hour traffic. Schedule your chores (or even hire a cleaner) and make sure that everyone else knows that your work time is your work time and that you can't just get up and do a favour for someone because you happen to be around. Turn off all distractions and that includes Facebook, Twitter, LinkedIn, BBC News and your Words With Friends alerts (I know... sorry) and ensure you complete your tasks. Also make sure you stay connected to your peers and participate in networking events. This might be something as simple as a twitter hashtag conversation or tweet-up (a meet up with Twitter friends in a local cafe) or as focused as an official networking event. When we work in an official work environment, we are provided with the right tools to make our job easier. If your line of work means that you spend a lot of time hunched over a computer, buy yourself a comfortable and adjustable chair along with a large screen and separate keyboard as this will minimise back/neck pain and cramps in your hands. Flexibility is key when working from home and you are afforded that luxury however, what works in the Summer may not work in the Winter. If you need to be away from work for another appointmento or you're working around the school run ensure that you make up the time in the correct way instead of burning the midnight oil. Your admin needs doing and unless you have a P.A. then there's only one person that can do it. Keep on top of the bill-paying and hire an accountant to do the nitty gritty as they know exactly what you can claim as expenses including petrol, stationery (yes, really...) and utilities. In fact, find out who your electric and mains gas supplier is as they may have discounted business rates for you.